Pen Y Crug Walk at Brecon/AberhondduWalking RouteFrom Brecon Cathedral and a residential part of town, the walk takes you to a superb vantagepoint, Pen y Crug, surmounted by the ramparts and ditches of an Iron Age hill-fort. You then drop down into the Usk valley where there is still evidence of Roman occupation: the impressive remains of a fort at the junction of important routes. The return is by lanes and bridlepaths back to the River Usk near the town centre. From the Information Centre turn right, with the town centre on your left, and walk to the far entrance to the car park. From here, down the road, you can see a crossroads controlled by traffic lights. Go down the hill and turn right into the Struet, noted for the facades of its many listed Georgian town houses. Continue along the Struet to the junction with the road to Upper Chapel: on the right, opposite the Bull's Head, is King Street - more appropriately called King's Steps. They were probably named after a visit to Brecon by King Charles 1 on 5th August 1645 to raise troops for his army in the civil war. Fifty metres beyond the steps, cross the road to walk over the footbridge and up a path between walls to a turning on the left which leads to the Cathedral and churchyard. Walk along the tree-lined avenue through the churchyard, pass under the Cathedral lichgate and turn right up the road to the top of Pendre. When you reach the timber-clad terraces on the left, cross the road into the estate and immediately turn right along the road which skirts its northern edge to reach a parking area just beyond a mini roundabout. Turn right and cross the field to Maen-du Well. From the well, cross the stile and walk across pleasant open fields along the faint line of a footpath leading up the hillside. Cross three more stiles before reaching the open common land. Ascend the path through the bracken to the summit of Pen Y Crug (331 metres/1088 feet). the former triangulation pillar is now stone-clad and has a 360* viewfinder on the top. If you wish to finish the walk here, return by the same route to Brecon. To continue, walk just beyond the viewfinder on the summit, and look for an old mast on the right. Walk towards the mast and carry on down the hill, keeping it on your left. Just beyond the mast you will reach a bridleway crossing in front. Turn left and follow the bridleway down to a gate. Go through the gate down a short lane to the metalled road. Turn left and continue, past the golf course, for some 800 metres to the village of Cradoc. At the road junction bear right and then turn left down the road signposted to Aberyscir, which turns right through ninety degrees after about 300 metres. After a further 1km, turn left off Pont yr Yscir and cross the field to Y Gaer Farm. Go past the house and into the farmyard. Access to the fort is beyond the farm buildings to the left, so you will need to go through the second gate on the left and turn right and go through two further gates. Retrace your steps through the farmyard, past the house and turn right on to a bridleway between two hedgerows. This is the course of the Roman road to Brecon. Follow the bridleway, keeping the wooded slopes of Fenni-fach on the right. After about a mile the path crosses an unmetalled vehicle track, where there is a cottage on the right. Carry on straight-ahead through woodland, keeping to the sunken lane until you reach a stream. Cross this via the footbridge, then follow the left bank downstream a few tens of metres to a grassy track on the left. Follow the track, passing a farm on your right, and continue along a down-hill section and to a small stream and a gate. Go through the gate and follow the sunken lane through the gates. The path joins a metalled road after passing some buildings on your right. 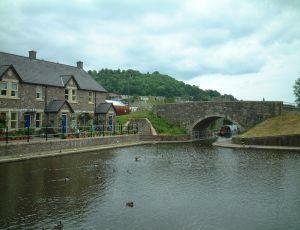 Turn left and walk into Brecon, passing the Promenade where refreshments are available in the summer. From the Boathouse follow the riverside footpath back into town. From Brecon Cathedral and a residential part of town, the walk takes you to a superb vantagepoint, Pen y Crug, surmounted by the ramparts and ditches of an Iron Age hill-fort. You then drop down into the Usk valley where there is still evidence of Roman occupation: the impressive remains of a fort at the junction of important routes. The return is by lanes and bridlepaths back to the River Usk near the town centre. Brecon is reached by the A40 road from the east or west or the A470 from the south or north. Brecon bus station has services from Cardiff, Llandrindod Wells, Newtown, Swansea, Abergavenny, Hay-on-Wye and Hereford.